Recommended by doctors more than any other pain reliever. Unlikely to cause upset stomach. Compare to Tylenol Regular Strength Tablets. 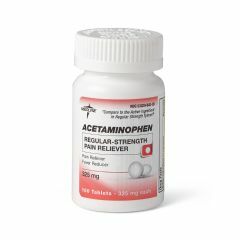 AllegroMedical.com presents The Acetaminophen Regular Strength Tablets. Recommended by doctors more than any other pain reliever. Unlikely to cause upset stomach. Acetaminophen, 325mg. Compare to Tylenol Regular Strength Tablets.